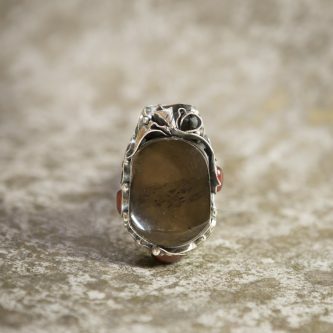 Known as the ‘Serenity Stone’ Smoky Quartz transmutes negative emotions. Helpful for curing mood swings, it clears depression, and heals grief. Uplifting, comforting and calming, Smokey Quartz enhances cooperation in relationships and groups. Emotionally, Smoky Quartz is excellent for elevating moods, overcoming negative emotions, and relieving depression. This stone transmutes stress, fear, jealousy, anger and other negative emotions. It is a helpful stone for enhancing and encouraging courage and inner strength. Smoky Quartz is good for balancing and improving one’s general health. It clears lymph, removes toxins, supports adrenals, kidneys, pancreas and intestines. Smoky Quartz can help you find a new state of being and attract others to help you on your quest.